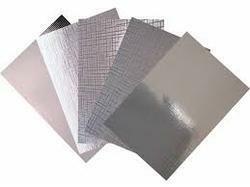 We are very much involved in making accessible a high-class assortment of Embossed Metallized Paper. This range is made-up at our advanced unit and as per present market demands. These products are obtainable in all standard options and diverse color options. In addition, products are accessible with us in numerous improved options that make us the most preferential choice amongst respected clients. Established in 1987, MD Foils a consistent Manufacturer and Supplier of high quality range of Aluminum Foils, Blister foil, Embossed Paper, Golden and Silver Foil laminated Board, Wrapping Foils for confectionery, chocolate, fireworks, Ice Cream Cones, Chewing Gum and Label Aluminum Foil. These products are extensively acknowledged in the marketplace for long lasting nature, precise designs, beautiful color blend and reasonable prices. Additionally, all these products are produced by experts as per current market demand. In addition, our units have employed capable professionals who are well known to the latest technology. They understand customer needs and make these products to match their diverse demands. Furthermore, we have been proficient in making huge customer base in the market because of quality and timely delivery of products.